After the official reveal a few weeks back, it seems that Argentina & FC Barcelona Star Lionel Messi is ready to break in his brand new signature football boots colourway of the adidas F50 adiZero. UPDATE: We’ve got some rather tasty images of Messi’s football boots for you to feast your eyes on in preparation for tonight’s game! As you can see – they are most definitely leather and have some wicked customisation to boot! Now that everyone and their brother has taken up the World Cup Messi colourway of Chameleon Purple/Electricity, the Barcelona sensation looks ready to set himself apart from the crowd again with the Metallic Gold adidas F50 adiZero. Both Messi and new Teammate David Villa started off the season in the Chameleon Purple/Electricity adiZero (both with the K-Leather Upper, we might add) in exceptional form – Messi bagging a hat-trick in the SuperCup and Villa and Messi helping themselves to a goal each in the La Liga opener against Racing Santander. One interesting observation is that Messi is once again in the leather version of the adidas F50 adiZero, and this is the first time we’ll have seen the leather version of the Metallic Gold adidas F50 adiZero, either on the pitch or in release shots. Messi and the rest of the Argentina squad are in training for what should be a fiery clash with Spain on Tuesday night – as Argentina are hosts of this year’s Copa America and Spain are reigning European Champs, neither have to qualify for their respective tournaments – meaning that in order to make this friendly worthwhile both teams are going to have to treat this as a competitive game! What do you think of Messi’s new football boots? We reckon they look great from a distance – but look surprisingly like the Sun Yellow version from the World Cup up close! Previous articleBOOT-SPOTS: BEST OF THE QUALIFIERS & BEYOND! I agree, the first pic they look good but the 3rd pic look like the sun yellow. adidas shot themselves in the foot.. 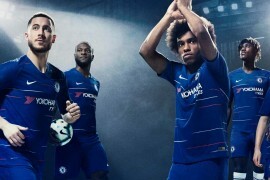 Very nice indeed, they would look better in the feet of a Brazilian player though. 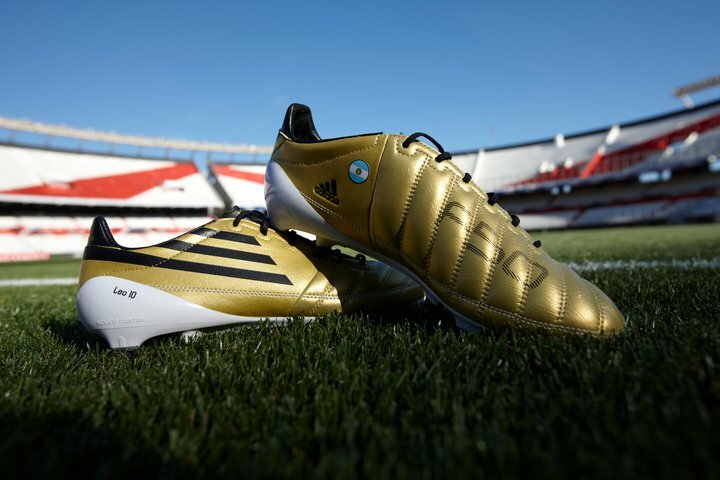 Messi may have his own specialized adiZero in K-Leather but he retail versions are SprintSkin Leather and not K-Leather. Hey Steve! Any idea when this was? We’ve only spotted him in the White/Black//Pink adiZero, which he wore against Mallorca! If you can give us an approximate date, or even better a particular match, we’ll get on the case for you! I am might get this awesome colorway tomorrow. It is easily my favorite of all adizero/superfly ii colors. 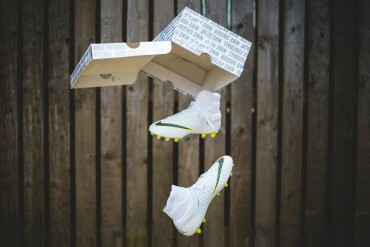 I am a bit skeptical because I keep hearing that if you play too hard in these the studs break, anybody else want to confirm this or give me a different opinion on the matter? however, I don’t know if anyone else is experiencing this, but the glue they use for the heel counter edges is starting to come apart…. not drastically, but I imagine after one years worth of wear the sole will begin to separate from the material more! But I guess it depends on how you play, if you don’t tackle a lot your boots will be under less stress. agree with many people look great in first bit too much like sun yellow in closer shots, but nevertheless looks like a classic boot. stands out a bit but not too much for messi. why do you think he wears the leather upper version? for the feel i guess, and i assume adidas knew he would so why dont thier realses aknowledge this, if its a boot for messi why not advertise the ones he wears? The adizeros aren’t k-leather, they’re just cow leather with a fancy name. I think the the boots you are talking about are the adidas – F50 adiZero White/Black/Radiant Pink. 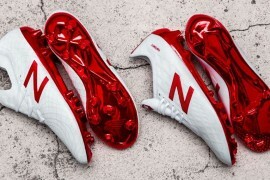 The only difference in Higuain’s pair of boots are that he replaced the bright pink laces for a little more understated white pair of laces, which in my opinion looked even better than the original boot design. hey kyle can u tell me the top players that are currently wearing the adizero in the synthetic version? 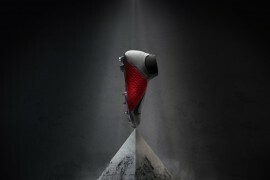 congratulations for messi with new boot hope ur hypi,easy and get cntrol game…..